FALL RIVER, Mass. 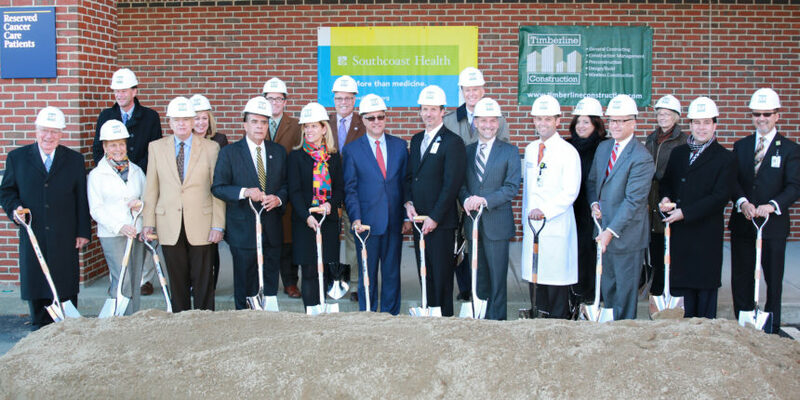 – Southcoast Health today announced it has broken ground on the Harold and Virginia Lash Heart and Vascular Center at Charlton Memorial Hospital. The new venue will house Southcoast Health’s expanding Cardiovascular Services, including a state-of-the-art hybrid operating room. This operating room of the future allows Southcoast Health to combine in one space several existing cardiovascular interventions currently performed as individual operations. Combining procedures is a less invasive technique than would be involved with separate surgeries, and studies suggest that less surgical staging and anesthesia reduces recovery time and inpatient lengths of stay. Studies also suggest that the hybrid OR will increase patient satisfaction and reduce overall costs. This cost reduction will be achieved by reducing length of stay, ICU usage and surgical infections. The dual achievements of reduced inpatient stays and fewer surgeries increases patient satisfaction. This project brings to Southeastern Massachusetts the latest high-quality, state-of-the-art technology in cardiovascular services. According to an article in the March 2014 issue of the American Heart Association’s magazine, Hospitals & Health Networks, by 2018 approximately 75 percent of cardiovascular surgeons expect to be working in a new and advanced surgical suite like this hybrid OR. This new operating room will be used exclusively for inpatients and is designed for a range of cardiovascular procedure applications, including Transcatheter Aortic Valve Replacement (TAVR) technology. TAVR is a highly-specialized valve replacement surgery that eliminates the need for open-heart surgery and gives new hope and relief from pain to high-risk patients with heart valve disease. Due to the complexity of these inpatient cases, Southcoast anticipates 40 to 50 TAVR and 124 open complex vascular surgical cases in 2015. The Harold and Virginia Lash Heart and Vascular Center will cost approximately $9.5 million to complete. The construction was made possible in large part by a donation from the Harold and Virginia Lash Trust and other major commitments from the Auxiliary of Charlton Memorial Hospital and the Oliver S. and Jennie R. Donaldson Charitable Trust. The multi-level, 6,700 square foot center was designed by JACA Architects and is being built by Timberline Construction Corporation. It is expected to open to its first patient in the Fall of 2015.